Fiber optic patch cable, often called fiber optic patch cord or fiber jumper cable, is a fiber optic cable terminated with fiber optic connectors on both ends. It has two major application areas: computer work station to outlet and fiber optic patch panels or optical cross connect distribution center. 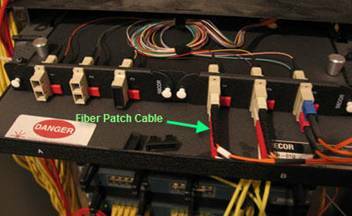 Fiber optic patch cables are for indoor applications only. 1. Single mode fiber patch cables: Single mode fiber optic patch cables use 9/125 micron bulk single mode fiber cable and single mode fiber optic connectors at both ends. 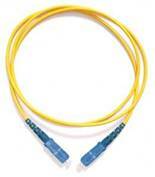 Single mode fiber optic cable jacket color is usually yellow. Here is the explanation of what is single mode and single mode fiber. 2. Multimode fiber patch cables: Multimode fiber optic patch cables use 62.5/125 micron or 50/125 micron bulk multimode fiber cable and terminated with multimode fiber optic connectors at both ends. Multimode fiber optic cable jacket color is usually orange. Here is the explanation of what is multimode and multimode fiber. 3. 10gig multimode fiber optic patch cables: 10Gig multimode fibers are specially designed 50/125 micron fiber optimized for 850nm VCSEL laser based 10Gig Ethernet. They are backward compatible with existing network equipment and provide close to three times the bandwidth of traditional 62.5/125 multimode fibers. 10 Gigabit is rated for distances up to 300 meters using 850nm Vertical Cavity Surface Emitting Lasers (VCSEL). 10Gig fiber optic cable jacket is usually aqua. 1. 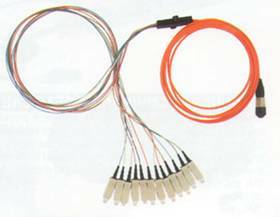 Simplex fiber optic patch cables: Simplex fiber patch cable has one fiber and one connector on each end. 2. Duplex fiber optic patch cables: Duplex fiber patch cable has two fibers and two connectors on each end. Each fiber is marked “A” or “B” or different colored connector boots are used to mark polarity. 3. Ribbon fan-out cable assembly: For ribbon fan-out cable assembly, one end is ribbon fiber with multi fibers and one ribbon fiber connector such as MTP connector (12 fibers), the other end is multi simplex fiber cables with connectors such as ST, SC, LC, etc. 1. Same connector type fiber patch cable: This fiber optic patch cable has the same type of connector on both ends, such as ST, SC, LC, FC, etc. 2. 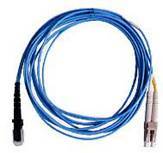 Hybrid fiber optic patch cables: This fiber optic patch cable has different connectors on each end. One end can be SC and the other end can be LC, ST, FC, etc. Connector Polishing Types: Fiber optic connectors are designed and polished to different shapes to minimize back reflection. This is particularly important in single mode applications. Typical back reflection grades are -30dB, -40dB, -50dB and -60dB. Refer to this connector fiber polish types document for more information. 1. PC (Physical Contact): Typical back reflection <-40dB, for single mode and multimode applications. 2. UPC (Ultra Physical Contac t): Typical back reflection <-50dB, for single mode applications. 3. APC (Angled Physical Contact): Typical back reflection <-60dB, for single mode applications. 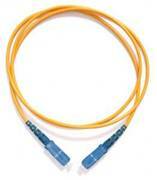 Stocking fiber optic patch cables available from Fiber Optics For Sale Co.